We drove back to Anabel, where there are no remaining structures familiar to us except the home of Virginia Griggs, widow of Charles, which was at the post office when we drove through in 1996. The post office has been closed for several years. 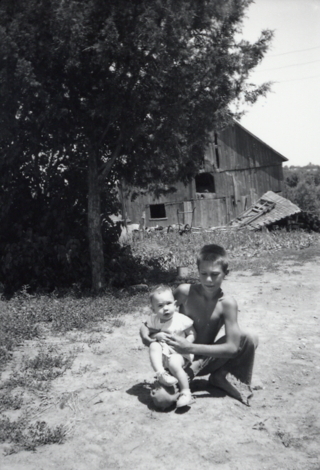 We drove out to the old Trachta farm, seven miles south of Anabel, on what is now called Mahogany Street, and took pictures. 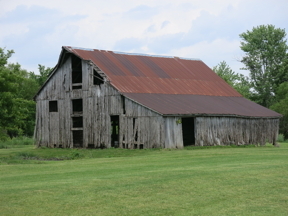 There are no recognizable structures left in the neighborhood except for the old Manley Graves Barn. It looked about ready to fall down but it looked that way when we lived there. Everything else, houses, barns, school, are gone without a trace. 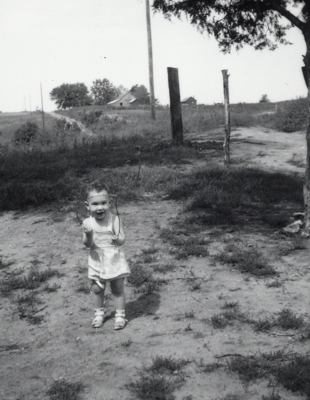 I walked down the hill, from where the school used to be, to where the house used to be, and, aside from the gravel on the road and the missing buildings, it all felt about the same as sixty years ago. 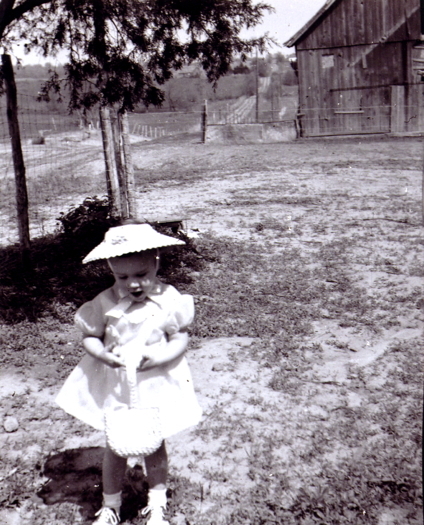 The black and white views on this page come from vintage 1950s snapshots. In the pictures above and left we are looking westward, from the property back up the hill to the school. 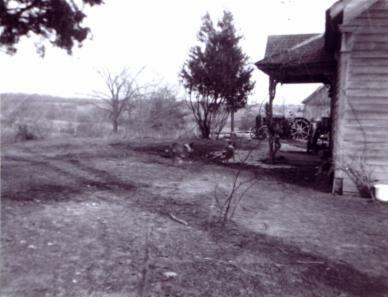 The Manley Graves barn can be seen on the right side of the road and the Bohannon School can be seen on the left side. The school is gone but the barn remains. 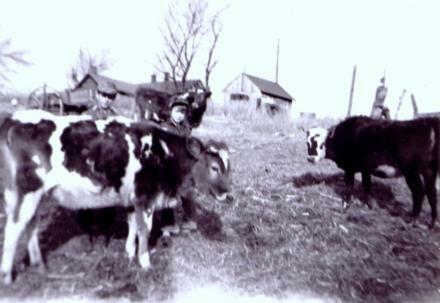 Also visible are the old farmhouse, now gone, and (left) some of the livestock. Above right are Gregory Trachta (striped shirt) and neighbor Jimmy Wray. 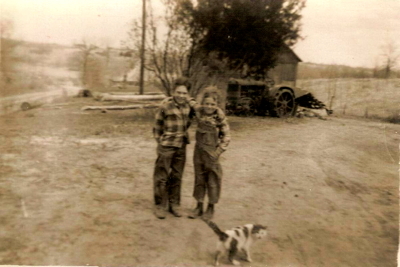 Above left is Janice Trachta with the Graves barn in the background. 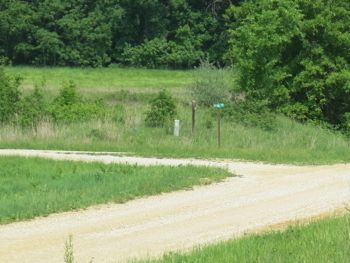 There is a new road into the property extending from the bottom ground up the hill to a large hog farming operation. We drove across the creek and back and then up the road to the old Walker place. Still nothing recognizable. 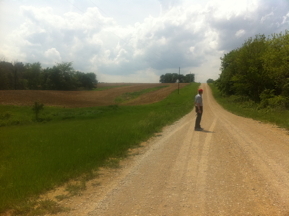 To the right, I am standing in front of where the house used to be, looking down toward where the barn stood. Below left, the road toward the Ruffner place extends out behind me, across the Creek. We called it Mad Creek but it has a less noble name now. In the bottom land we can see the new driveway extending off the road to the right. It goes up the hill behind the trees to a hog farming operation. Signs said to keep out. At the bottom right is the corner where the mail boxes stood. Allen Cox used to come by inhis all-weather, tractor-wheeled car to deliver the route. The above pictures show the view from in front of the farm house eastward toward the Rufener place. 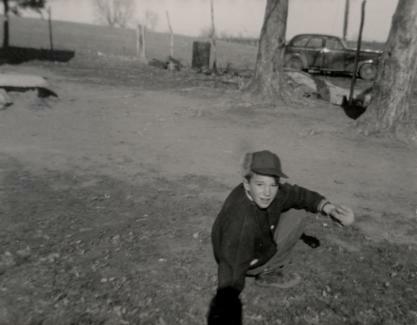 The black and whites are vintage 1950s photos. The road is recognizable but all the buildings are gone and the groundappears to have been lowered. 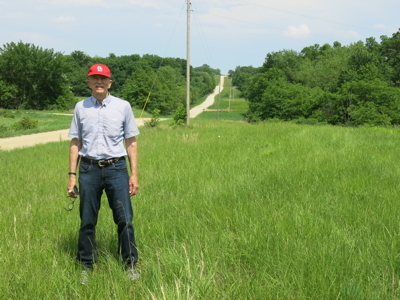 The road formerly ran below the property and it now runs almost even with it. The tractor visible in the vintage pictures is a McCormick Deering 10-20 that was cannibalized to service a McCormick Deering 10-10 model. 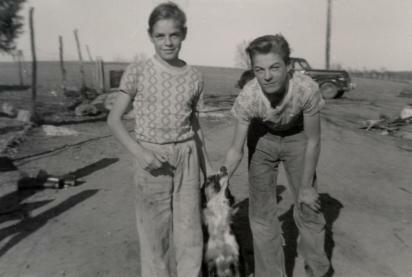 The two boys, above, are Mel and Greg Trachta. The cat is named Mac. 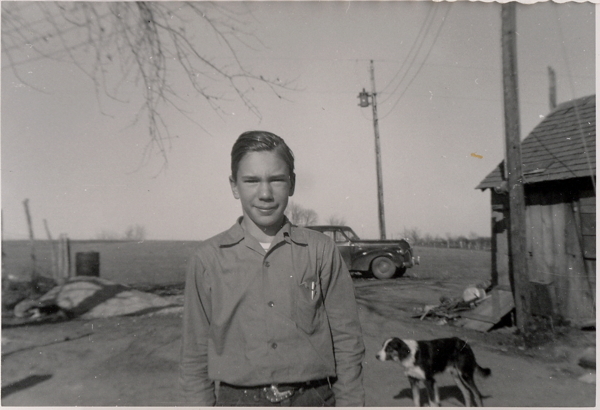 The two dogs running in the picture on the right above are Mike and an unknown friend. The view at right is looking eastward, in front of the house toward the barn. That is Melton Trachta and sister Janice. Below are views from behind the house looking toward the road. Today, the area is swept clear, no trees or buildings, nor any trace any ever existed. There was a cistern to the east of the house, and there is no indication of it at all. Perhaps it was filled in. 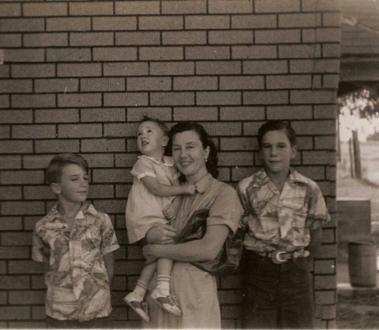 Above, top left, (L-R) Gregory, Janice, Wanda, and Melton Trachta. Top right, Gregory Trachta. 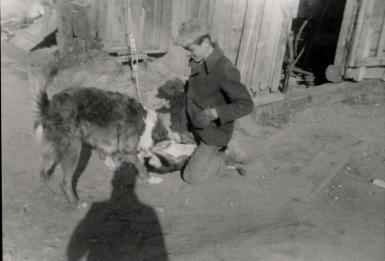 Bottom left, Claire and Jimmy Wray with the Trachta dog, Mike. 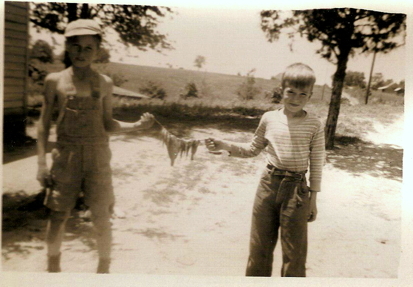 Bottom right, Mike and Jimmy Wray by the shed. Immediately above, Melton Trachta, with Mike, as Mel heads off to high school. 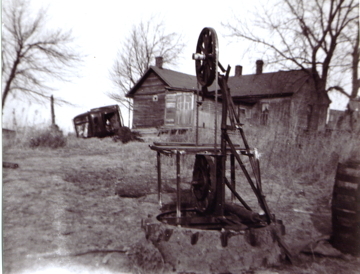 Below, top left, view of the back of the house showing Dad's band saw. 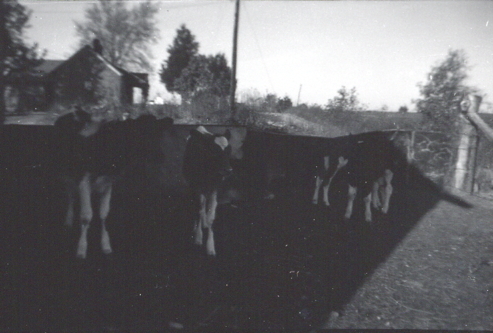 Below, top right, unidentified friend and Gregory Trachta with various cows. They all had names but they are lost in time. The house and shed are visible in the background, viewed from the back at about the same angle as in the picture on the left except from further down the hill. 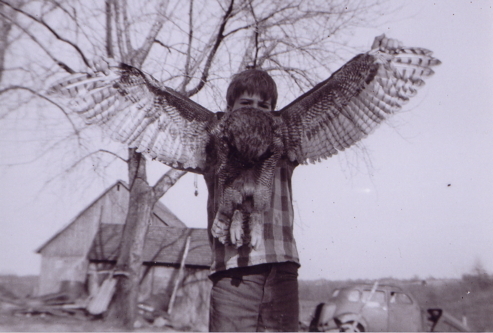 Below, center, Gregory Trachta holding an owl that we speculate was struck by lightning. Barn and shed are in the background, along with the family sled and the remains of the 1935 Plymouth we drove from California in the winter of 1946-47.